I can't recall this ever being a problem until recently. I'm running Mandriva 2010 (I haven't gone to 2010.1 as this has been so stable), with a HP F2480 printer. 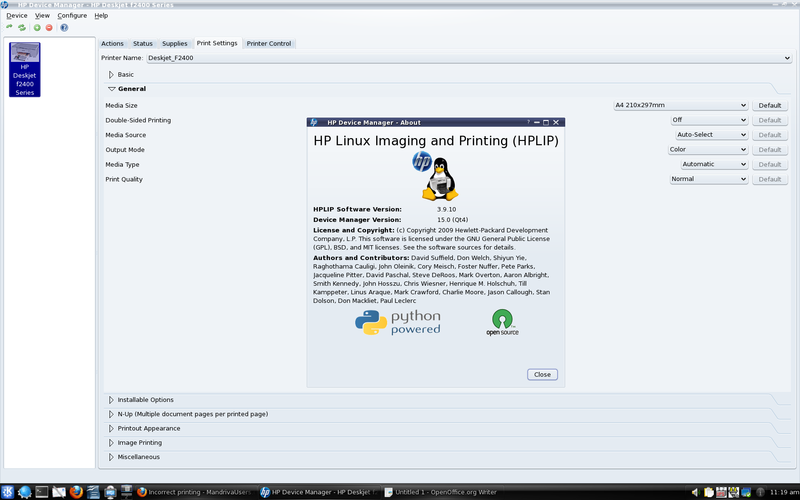 I have installed HPLIP V3.9.12. from the repos. I have the printer properties set to A4, I have document settings set to A4. It is only a problem with my HP, as I have connected an epson and that prints perfectly. The top margin is some 1.5cm or more too large, and then the bottom of the page gets cut off. This is most annoying with important documents. I had the same problem with my HP deskjet 845C. If I remember correctly, the problem was resolved by updating to 2010.1. Before that, I just had to reset all my document settings in OpenOffice to compensate for the problem. Maybe there's a different "cups" file you can install which will take care of the problem. So you got it fixed in the end by stepping upto 2010.1? Not sure if I'm waiting for the next mandriva, or mageia. I'm using an F2430 with Mandriva 2010.0 and HPLIP 3.9.10 without any problems. Are you using your 'HP Device Manager' to set it up? Just had a look in HP device manager, that too is set to A4.